Heat the oven to 180C. Line 4 tart tins with pastry and blind bake for 10-15 minutes (they need to be slightly golden). Melt the chocolate before mixing in the cream and ground hogweed seeds. Whisk eggs and sugar until thick and creamy. 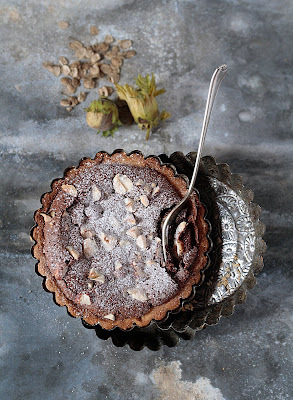 Carefully fold in the chocolate mixture and about ¾ of the hazelnuts. Spoon into tart cases, sprinkle remaining nuts on top and bake for 10 minutes.